Quartz crystal symbolizes peace and clarity. Some people even believe that these crystals have healing properties and wear crystals as pendants. Copper-wrapped crystal pendants sell for high prices in New Age and metaphysical stores, but making your own crystal pendant necklace is easy and inexpensive. Even if you have never made jewelry before, you can make your own copper-wrapped pendant—and embrace prosperity, light and a new affection for jewelry-making in the process. 1. Cut approximately 5 inches of copper wire from the roll. 2. Slip about 1 inch of the copper wire through the hole on the left side of the quartz crystal. 3. 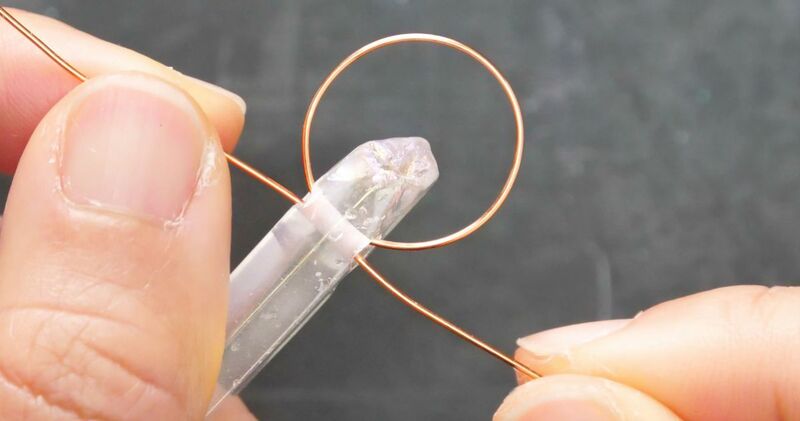 Feed the remaining length of the copper wire backward through the hole on the right side of the quartz crystal. Note the loop on top of the crystal: It acts as a knot to secure the crystal to the copper wire. 4. Pull the wire taut. 5. Wrap each end of the wire around the top of the crystal. 6. Cut 10 to 12 inches of faux leather cord from the spool. 7. Slip the cord through the copper hoop on top of the crystal. 8. Ensure both ends of the cord line up evenly. 9. Tie the ends of the cord in a knot. 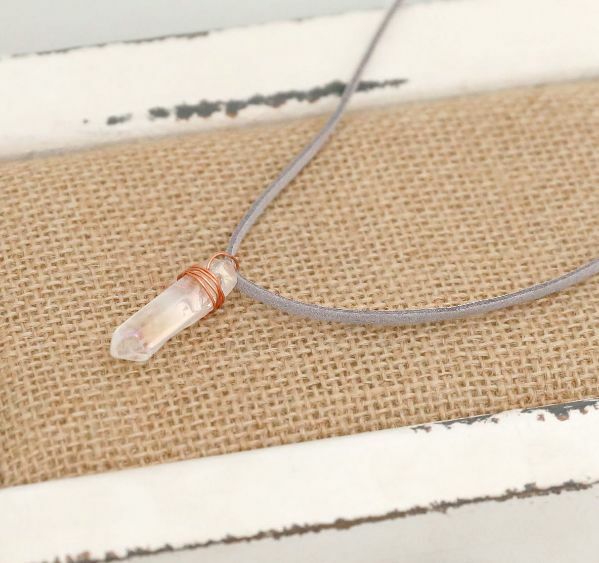 Share your new copper wire quartz necklace on Facebook!